Diplomacy Dessert hosts invite their friends, family and/or colleagues to their home on a weekend afternoon for 2-3 hours to socialize, enjoy dessert, and learn about CDI. To attend the event, Diplomacy Dessert participants donate a minimum dollar amount per person, paid before the event online here, or at the event by cash or check made out to Learning Life. When possible, and if the host likes, the event can include a live internet dialogue with one of our foreign families. You don’t have to live in or around Washington DC, where Learning Life is based, to host a Diplomacy Dessert. 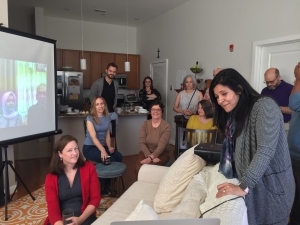 We can present to your group live online via Facebook or Skype if you have a high-speed internet connection at your home. Create a list of friends, family and/or colleagues you would like to invite to your Diplomacy Dessert. At least 10 people should RSVP their plans to attend for the event to occur, so we recommend creating a list of at least 25 people. Consult with Learning Life staff to set a date, time, agenda, and the donation amount per person for your Diplomacy Dessert. We recommend setting aside three hours: the first 1-1.5 hours for socializing, 30-60 minutes for presentation and discussion about CDI, and the remaining time for further socializing. Send out the event invitation at least two weeks in advance, with 1-2 reminders until the event. The invitation should make clear that this is a fundraiser with a minimum donation per person. We can take care of the email invitation for you via Evite if you like, or provide you with an email template. Make or buy whatever desserts or sweets you think your guests will enjoy. Enjoy your Diplomacy Dessert! At the appointed time, Learning Life’s founder, Paul Lachelier, will lead the presentation (including photos, video, and/or live dialogue with a foreign family) in person in metro DC, or otherwise via Facebook or Skype. Interested in hosting a Diplomacy Dessert? Contact us at email@learninglife.info.